The Numark Orbit DJ controller was announced earlier this year at NAMM 2013 and we&apos;ve finally got one in the DJbooth.net Lab for a full out review. The Numark Orbit is very small and compact with rubberized performance-style multi-color-backlit pads on each side to control different DJ software functions, a jog wheel in the center, and accelerometers inside for motion sensor style control. DJ&apos;s can perform with the Orbit via USB port (connected to a computer which also charges the unit) or wirelessly on the dancefloor with the crowd. The Numark Orbit is very small and compact with rubberized performance-style multi-color-backlit pads on each side to control different DJ software functions, a jog wheel in the center, and accelerometers inside for motion sensor style control. DJ&apos;s can perform with the Orbit via USB port (connected to a computer which also charges the unit) or wirelessly on the dancefloor with the crowd. The Numark Orbit can be programmed and mapped to work with almost any DJ software out on the market today. DJ&apos;s can use the PSP/game controller-like surface in order to access cue points, loops, effects, samples, or any other mappable DJ function on the fly. The Numark Orbit is very solid and sturdy and it&apos;s definitely built to last. The body of the device is made of mostly very thick plastic with a very rugged rubberized coating over the entire unit. The Numark Orbit is built in the same shape of the Sony PSP personal gaming system or a gaming style controller, complete with shoulder buttons that activate the X and Y axis of the accelerometers located inside the unit. 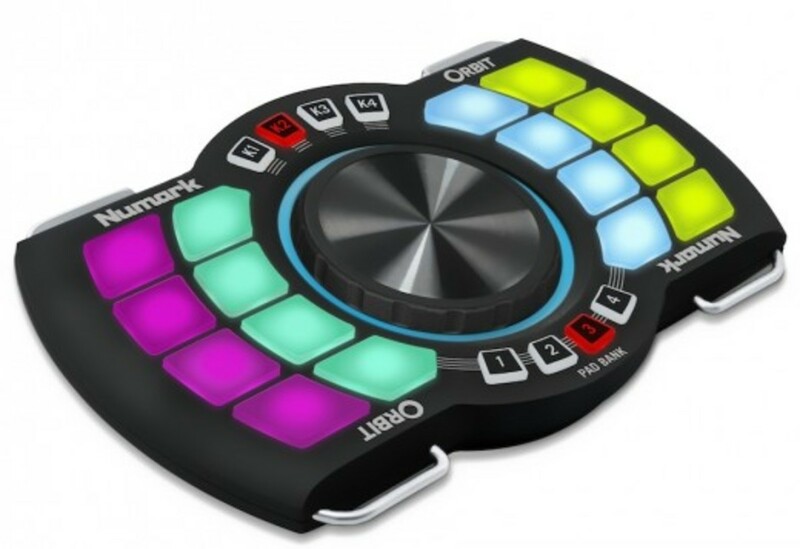 All of the buttons and pads are rubberized and are back-lit RGB meaning they can be set to multiple colors using the Numark Orbit Editor software included in the download package. The huge knob in the middle of the Numark Orbit has a lit outer ring and a rubberized outer edge for easy manipulation. The middle face of the wheel is made of a textured metal material. The shoulder buttons are plastic even though they have a chrome paint finish. On the underside there is a USB port for the cable for the computer connection and charging and an ON/OFF switch to save the 8hr batteries when not in use. On the underside, there are also metal loops that can be used to strap down the Numark Orbit using the included nylon strap. The Numark Orbit comes with two USB cables (one long and one short) and a wireless USB Dongle for when the DJ wants to use the Orbit without the cable connected. There are no software included in the box meaning you have to go to the Numark DJ website to download the Numark Orbit Editor and the Numark OrbitDJ software. 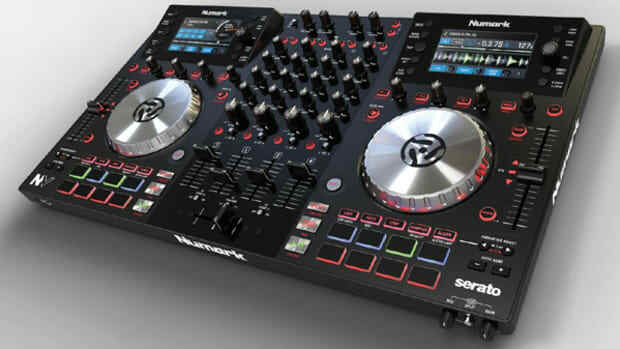 You will first have to register with Numark, then input the serial number in order to download the software. 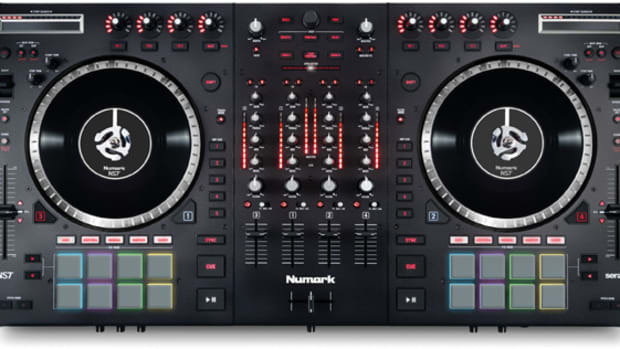 The Numark Orbit is plug-n-play class compliant hardware, so there are no drivers necessary. Once the two software are downloaded and ready to go, simply plug in the Numark Orbit and start the Editor or the player. 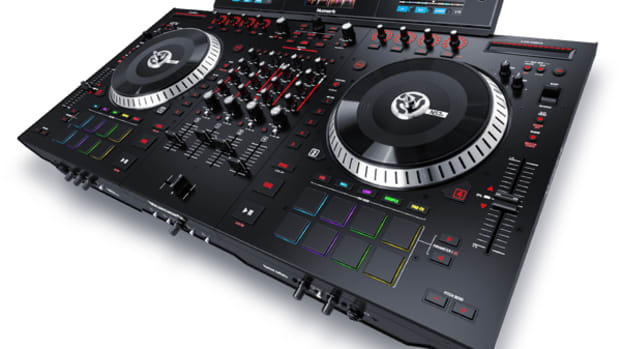 The Numark website also supplies users with three different style of Traktor Mappings for two deck control, four deck control, or even track preparation/Beatgrid mode to prepare and load tracks for playback. The Numark Orbit can be mapped to almost any DJ software of choice as long as the software is MIDI Map compatible. There are eight non-velocity-sensitive back-lit multi-color rubberized pads on each side of the jog wheel bringing the total number of pads on the face of the unit to 16. These 16 pads have four Pad-Banks which give each button four different programmable uses. Each of these pads can also be assigned a different RGB color via the Orbit Editor software or on the face of the unit using a special sequence. These buttons have a good tactile feel and are perfect for juggling and hotcueing with great precision. There&apos;s up to 64 different programmable uses for the pads meaning DJ&apos;s will have lots of headroom when setting up functions to control their software. I&apos;m sure someone will map the Traktor Remix decks in due time so I&apos;d watch the Numark website and forums closely for additional mapping files for popular DJ software. The huge jog wheel in the center of the unit has a nice and tight tension to it so that it can&apos;t be accidentally manipulated while moving around. There is a blue outer LED ring around the wheel that shows the current value or level of the parameter. The face of the jog wheel is metal with a ribbed surface while the outer edge is rubberized. The Jog Wheel is NOT touch-sensitive and can&apos;t really be used for playback as on other DJ controllers. It&apos;s more of a knob or fader style manipulation tool. The Wheel also has four banks (K1, K2, K3, K4) and up to four uses per bank (1-4) bringing the total programmable uses for the jog wheel to 16. Popular uses for the wheel are volume control, crossfader control, effects depth, sampler volume, etc. The internal X and Y accelerometers are activated by the left and right shoulder buttons. The Left shoulder button controls the X axis and the Right shoulder button controls the Y axis. The user can double tap the shoulder buttons to permanently activate the accelerometers, or the user can simply push and hold until finished with the effect. These can be programmed to handle any knob or fader style parameters within any DJ software, but they seem to work the best with effects; as is the case with the default Traktor mapping and on the Numark OrbitDJ default software setting. The Numark Orbit DJ controller makes for a great auxiliary controller to any DJ setup. The Numark Orbit works great in the hands where the thumbs work all of the buttons and controls comfortably like a game controller. The rubberized buttons have nice springy feedback and are great for drumming and triggering hot-cues and samples perfectly on-beat. There is zero latency when plugged into directly into the computer and I was able to pull off some good hot cue routines from over 25ft away with ease when working in wireless mode. The wireless function worked strong for a full six hours but others have stated they used the Orbit for well over the advertised eight-hour battery time. The Numark Orbit comes with the OrbitDJ software that allows users to see what the Numark Orbit is really capable of. In the OrbitDJ software, users can trigger hot cues, loops, effects, volume controls, and playback controls. OrbitDJ is not a real DJ software since you won&apos;t be able to pre-cue songs or hook up any type of soundcard device, but it shows the capabilities rather nicely. DJ&apos;s will have to get an actual DJ software like Traktor, Serato, or VDJ in order to unlock the full potential of the Numark Orbit. The Numark Orbit also comes with the Orbit Editor which allows the user to fully customize, save, and recall the mappings of the Numark Orbit. 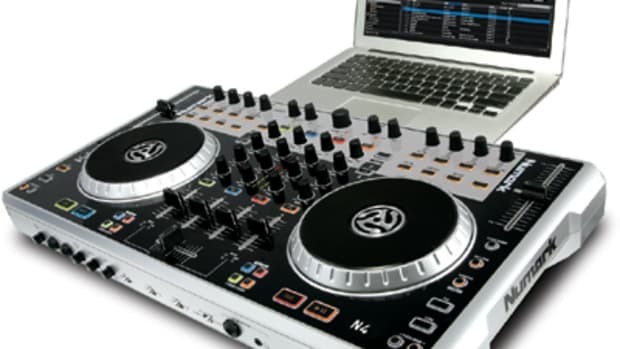 Users can change the button colors and all the other programmable parameters available within the selected DJ software. One of my minor gripes with the unit is that the Orbit controls are very good when used in the hand with thumbs, but the I didn&apos;t find the Orbit as satisfying when used on a tabletop or stand with fingertips. When the Orbit is on a tabletop, the accelerometers won&apos;t be used since the device won&apos;t be in constant motion. The Numark Orbit is a small and compact MIDI controller that is fully programmable and compatible with almost any DJ software all for an affordable price. The Numark Orbit also has good wireless operation and good battery life making it perfect for DJ&apos;s who want a break away from the decks during a gig or party. The Numark Orbit is built to last with a very solid and rubberized construction throughout. 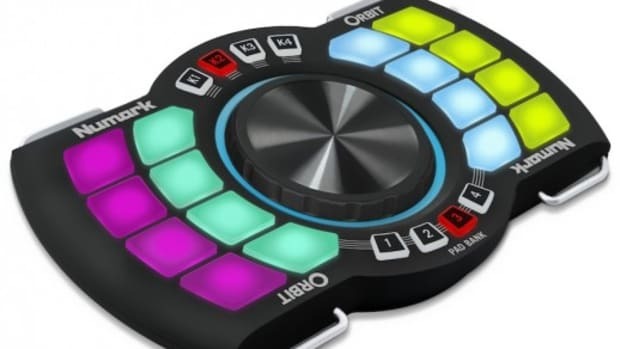 On the downside, the Orbit does not come with a real DJ software and the Orbit works best when in the user&apos;s hand but control is not as intuitive or fluid on a tabletop. There are a few different DJ types that I think would benefit from adding a Numark Orbit to their setup. The first DJ that could benefit from the features of a Numark Orbit are DJ&apos;s who already have a DVS or DJ controller setup that simply want more buttons and controls for different software features. The next type of DJ that would use a Numark Orbit would be performing or mobile DJ&apos;s who want a wireless controller to move from behind the decks and onto the dance-floor to get the crowd hyped or to take a quick break. I would also recommend the Numark Orbit to any DJ that wants a compact controller to take with them on the go. The new wireless compact Numark Orbit Digital DJ controller is now in the lab for our full review which is coming shortly. In the meantime, Numark has released a couple of new videos to show the public the many ways people can use the Numark Orbit to control the various functions of their favorite DJ software. Check out the Numark Orbit Tour and DJ Software overview videos, and be sure to watch this space for the full review treatment.